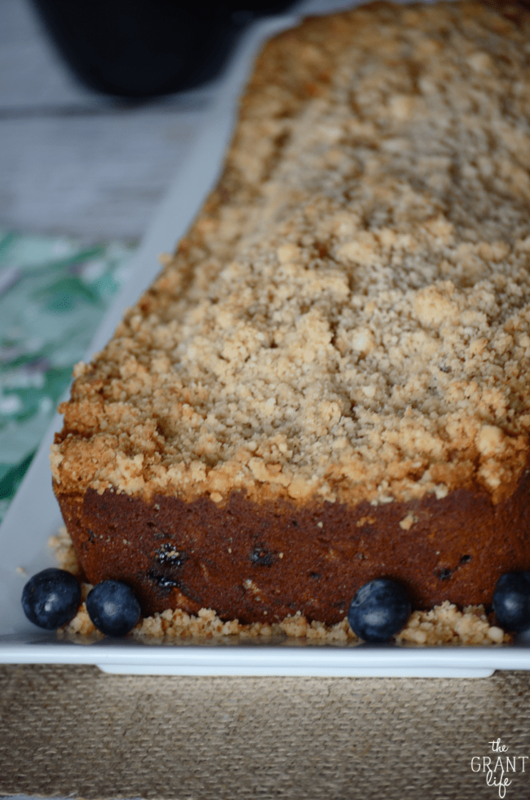 Ripe bananas and blueberries are covered by a cinnamon crumb topping in this blueberry banana bread. Yesterday marked day 2 of Spring break for the kiddos. It also marked the second pajama and movie day at the Grant house as well. For some reason I thought I would be all kinds of productive while the kids were out of school this week. I even planned a few crafts and some recipes for us to do. I’m here to tell you that pretty much none of that has happened. I did however binge watch the full first season of the Unbreakable Kimmy Schmidt with Avery. So I’ll count that as a win. Ryley asked me “Are we going to school today?” I said no, not today. You would have thought I told her all her Shopkins disappeared. She was super bummed that she had to spend another day away from school. She doesn’t understand yet that Spring break is a whole week. I don’t have the heart to tell her that part yet. She just keeps naming all her friends in class between watching cartoons and torturing her brother. I know it’s silly but I didn’t realize how much we all got used to our little routine. And by routine I mean wake up late, brush the kids teeth/hair, and toss them breakfast as we are walking out the door sometimes without shoes. (cough Avery cough). I’m not a morning person so we tend to toe the line on being on time and late in to school most days. I just assumed that I would still be as productive during the week minus the rush of getting everyone out the door. That’s totally not the case at all. Not having to wake up at a certain time has just made us all lazier and groggier. If that is even possible. I’m actually looking forward to getting back into our crazy morning routines next week. I mean, I’ll have to wear real pants again, but at least I might have some hope of being productive. Preheat the oven to 350 and prepare a loaf pan with cooking spray. Mix together the mash bananas, vegetable oil, yogurt, eggs and vanilla until smooth-ish. In another bowl whisk together the flour, sugar, baking powder, baking soda and the salt. Fold the wet ingredients into the dry ingredients and pour into the prepared loaf pan. 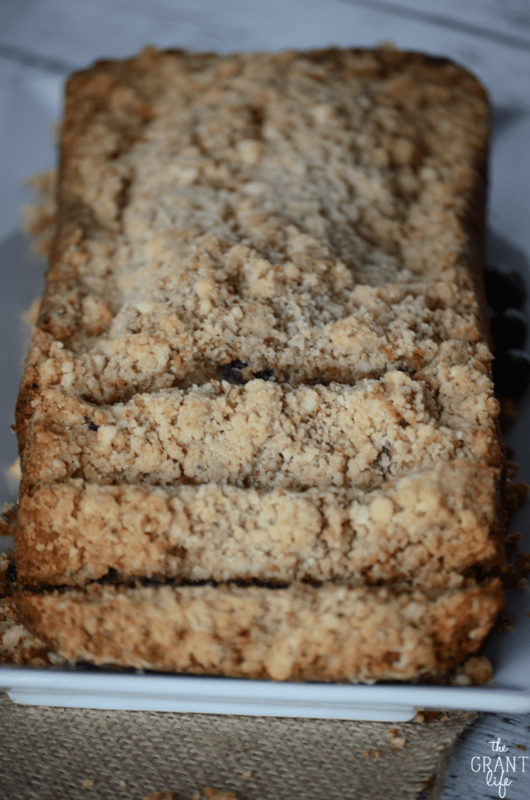 Mix together the powdered sugar, flour, melted butter and cinnamon for the crumb topping using a fork or your fingers. Let cool for 1 hour before removing from the pan. 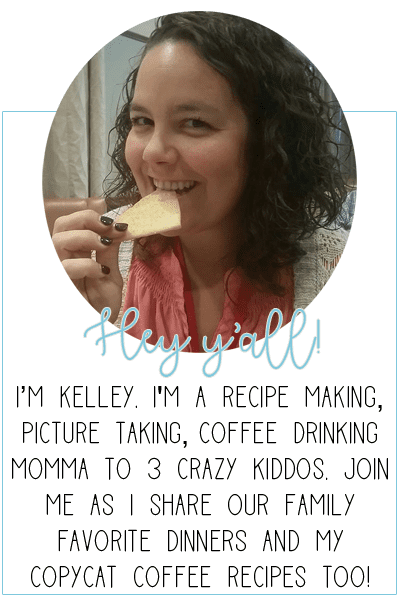 And sign up for our recipe updates! Lol, this post cracked me up! It’s basically my life in a nutshell. 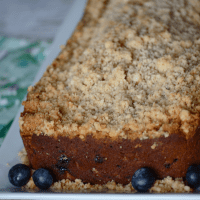 🙂 And this banana bread.. adding blueberries sounds SO good!! Maybe it’s a boy thing. I’m ready to sleep in, get sunburnt, and I’m totally watching The Unbreakable Kimmy Schmidt because you are the 4th person I’ve seen mention it this week! This bread looks delicious! I was thinking about banana bread earlier. I think I’ll try your recipe tomorrow! YES! Its such a good/addicting show. Actually its probably more addicting then good. If that makes any sense? You want to know whats going on.. so you keep watching. Hope yall have a great Spring Break! I adore a crumb toppings! I also adore yoga pants now that I stay home, and I dread when I need to put on real pants! There are two of my favorites right there in this delicious bread!! I’m not productive AT ALL when the kids are home. Since my foot has been hurt, I can’t walk the kids to school so my husband does it. That means I don’t have to get dressed, and I’m usually in my PJs until I have to hurry to pick up my oldest after lunch. I feel like such a lazy bum. I’ll be glad when I can get back to my daily routine too! This bread looks so good. Please be advised that I have bananas an blueberries waiting to be made into bread right this very minute. My recipe will be much different, but I promise I already had the idea days ago! HAHA! No worries friend. I’m sure blueberry banana bread is not revolutionary or anything. I mean it’s totally delicious.. but I’m pretty sure it’s been done before. 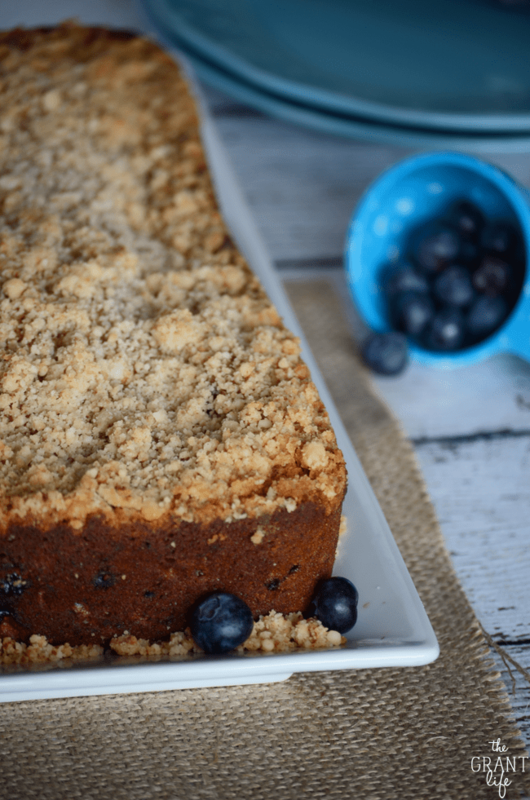 Can’t wait to see what you create with your blueberries and bananas! 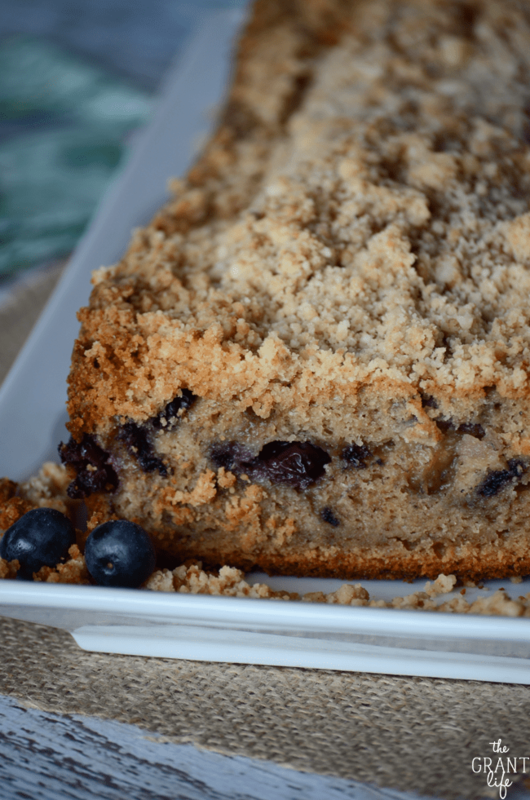 Blueberries and bananas together in one bread? YES PLEASE!!! !